I am what I guess would be described as a devotee of the modern cuisine. I love what is happening as chefs evolve out of the strictures of the French haute generally accepted the world over as standard and move toward a thing comprised of all the greatness the world has to offer. As a result of the kind of exciting cross-pollination that happens when chefs in Asia work with foie gras and guys in Europe add wok techniques, the added finesse is reinventing the simple cuisines of the world's humbler cooking, while gastronomy is benefiting from an infusion of soul. 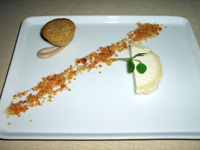 My heroes of the modern cuisine are those who play with their food and with our expectations of food. Adrià, Achatz, Andréa, Blumenthal, Katsuya, Dufresne, Liebrandt, and a cast of others have come to my attention as those pushing the envelope with their food. Breaking boundaries, confounding expectations, learning and sometimes inventing new technology, and making flavors become more, this group has literally redefined cuisine at the top level and the effects trickle everywhere. At this point, this movement is entirely chef driven. Having had no Escoffier to regimentize and compartmentalize it, it is not a business that’s can be passed to some one with a degree yet as much as an art. The chefs getting attention in this school are intrinsic to its success. No one owns a group of these places, the chef is at his place creating his food, so there is a sense of urgency; better get to him before he moves on and his hands aren't involved any more. The things being done with food by this circle are deeply contemplative and often very layered; to draw attention to this there seems to be a tendency to come up with challenging methods of service. Liebrandt, a Brit, is one of the two guys who have been trying to introduce these new approaches to New Yorkers, Wylie Dufresne being the other. As is often the case with trying to convince New Yorkers, he seems to have reverted to aggressive tactics in his early attempts. Paul Liebrandt plays the role of the avante garde fetishist in this cast of characters. As a seemingly precocious youth, Liebrandt made a name for himself as a talented and inventive young man taking the dining experience off the plate and invading your personal space with it. People speak of blindfolded and handcuffed meals, and courses served from baby bottles. 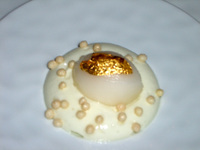 Chef Liebrandt has now opened Gilt, in the Palace Hotel at 50th St. and Madison Ave in midtown. Someone has decided to wedge one of the most modern chefs in NY into one of the most traditional and staid rooms in town. And wedge it does, it was either decided or directed that the beautiful old room Gilt occupies not be altered in any way to accommodate the new place. The bar has as the side of the room what can only be described as a contemporary sculpture. A tubular construct of purple fabric and brass, is set within the room running next to, (but not touching the gorgeous wood paneling) it serves as seating, perimeter, and decoration. The dining room furniture is an engineered structure of plastic and brown leather that seems to have been carefully placed within inches of the interior it occupies, again fitting the space without changing or harming it, somehow declaring "I am current in the middle of the traditional haute ideal." We (Bear, Zaphod, Normal, Coolio, Pharyngula and myself) met in the bar and started with cocktails. There is a tradition in luxury hotels in midtown Manhattan for cocktails to run upwards of $25 dollars apiece; this is ludicrous and I'll never understand it. That being said, the Cocktail list is divided into traditional and modern. Feeling it was somehow part of the experience, I asked the waitress to choose her favorite of the modern cocktails. She chose a Jus Vert, comprised of grey goose vodka, English cucumber juice (Screaming Viking anyone? 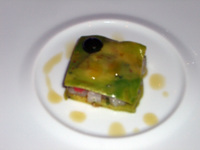 ), granny smith apple juice, a drizzle of olive oil and garnished with shiso leaf and fleur d'sel. The ingredients came together quite nicely to taste reminiscent of banana-pineapple juice and I am glad I tried it. Going forward, though, I will not support the market for $25 cocktails. We were a group of six and when I made the reservation it was explained that the chef's tasting menu was served to groups of six or larger. However when we sat we were given lists that offered 2 price-fix menus, again modern and traditional. Both consisted of an appetizer choice and an entrée choice from selections of about 4 or 5. 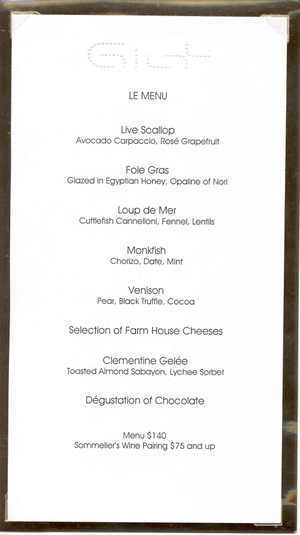 In the center of the menu was a card with "Le Menu," an 8 course tasting offered with wine parings. With little discussion, we decided to have the chef's tasting menu and supplement the wine service slightly. Passion fruit marshmallow with chorizo, Stilton arugula financier: the soft, sweet, slightly tart, marshmallow was rolled in a zesty chorizo dust. 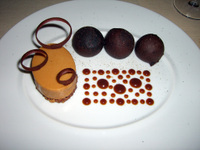 The financier itself was slightly bitter, playing well off the pepper and richness of its contents. 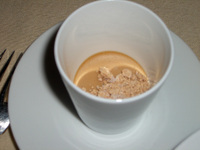 Foie gras royal with sumac caramel powder: the royal was light while the caramel developed a chew as your mouth re-hydrated it, sapidity of the sumac making the caramel sweeter, both drawing richness from the foie. 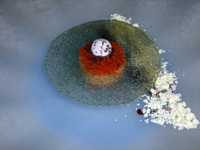 Black olive crumble with saffron ice cream: great familiar flavors in new textures and temperatures. Live Scallop Avocado Carpaccio, Rosé Grapefruit: "live scallop" is becoming lingo for "they came in the restaurant in shells." This is important because most scallops, even diver scallops, are plumped with a solution to keep them moist once they are out of the shell, which is one of the big reasons they are so hard for you and me to brown and they often taste of chlorine. The grapefruit was just this side of freezing which was off-putting to some of my cohorts, but I liked how it toned down the sweetness of the fruit leaving just the acids to play off the scallops' sweetness, the avocado's richness, and the olive oil's pepperiness. 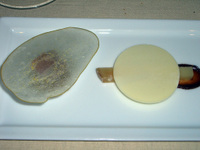 Foie Gras Glazed in Egyptian Honey, Opaline of Nori: a torchon of foie on top of a fig with sweetness from the honey all contrasted by the slightest vegetal bite of the nori crisp. Served with toasted brioche and black truffle butter, we ended up making fantastic little sandwiches. Loup De Mer Cuttlefish Cannelloni, Fennel, Lentils: the Cannelloni was a tube of cuttlefish flesh stuffed with duck forcemeat. This preparation allowed the fish to taste like fish, without being a bad thing. 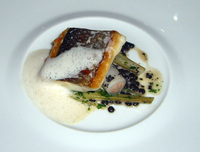 The fish's natural essence was the focus as this dish exactly as it should be. 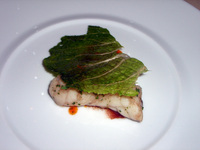 Monkfish Chorizo, Date, Mint: a crisped lettuce leaf brought the slightest sense of texture to this subdued dish reminiscent of an Iberian chowder. 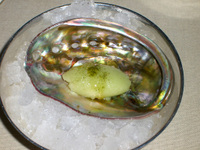 Wasabi and Green Apple Sorbet Manni Olive Oil: an intermezzo both hot and cold, all tempered by the coating oil. Venison Pear, Black Truffle, Cocoa: the cocoa was a sweet chocolate crisp but the coolness I perceived was a bitter black dust that I suspect was ground espresso. It pulled real sweetness out of the venison. 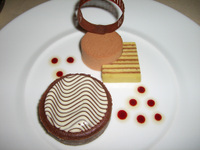 Chocolate / Chili, Tangerine Chocolate Tart, Ancho Chili Parfait, White Chocolate Biscuit. The Ancho Parfait may be the first awesome thing to happen to dessert since every single person in the world stated making molten center cakes (which also appear here). My brain turned the heat/sweetness into memories of great cinnamon candies, it was actually fun to eat. 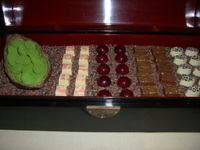 Chocolates: earl grey and green tea truffles, white chocolate with passion fruit, white chocolate with coconut, Grand Marnier and hazelnut milk chocolate, dark chocolate and sherry. I went in wanting genius inventiveness and got genius skill. It would be foolish to say that chef Liebrandt and his team are anything less then exceptional, the food is both creative and exact. There was great technique and very sound method. 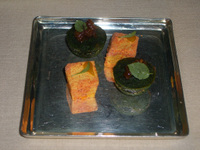 Great balance and subtlety was omnipresent while dishes benefited from new methods like the process to powder a chorizo. Somehow, I was let down though. I went in wanting avant garde flourish and got the most modern of fine cuisine in an exact and sober environment. 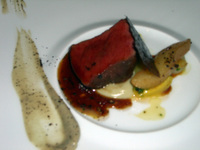 Maybe at 29 the chef has matured and is letting his skill speak through food rather than flash. Maybe the room has sucked the brashness out of him. Maybe he realized that, as much as New Yorkers like to point at the rest of the country and call them backwards, we get very aggressive when pushed outside our particular comfort zone. Maybe the menu for 6 plays a safer line than other offerings. Or maybe all the attacks Gilt has gotten for things as silly as luxury item premiums have caused standardization. I don't know. Sadly, I missed the crazy days of Liebrandt. My dispair is all based on my conjecture gleaned from buzz. The truth is the food is fantastic, and I will go back soon to see it without the weight of expectation. I wanted Dali, I got Van Gogh. In general, I probably much prefer Van Gogh, unless I thought I was going to a Dali show. I don't know what I will think next time. I'll go in a smaller group and probably go á la carte and take a little more control. At this point I am sure of two things: Paul Liebrandt is a great chef, and $25 is RIDICULOUS money for a cocktail.